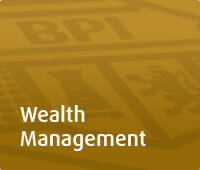 BPI Asset Management and Trust Corporation is committed managing the wealth of our individual clients. Our personalized approach allows you to acquire wealth and grow them through solutions tailor fitted to your unique investment requirements. Only BPI Asset Management and Trust Corporation truly understands your needs. Whether you are just starting to invest and need the guidance of our Investment Counselors to help you understand your options, or already have a deep understanding of investments and ready to look at how your different financial goals mesh together, you can count on BPI Asset Management and Trust Corporation to be there every step of the way. Our capabilities allow you the flexibility to do self-service investments via the internet, or financial advisory and fund management through our Investment Counselors, all at your own convenience. We have also made our wide array of investment products more affordable so you could build wealth earlier, easier. Trust BPI Asset Management and Trust Corporation, awarded as the Wealth Management of the Year of Asian Banker Philippine Country Awards in 2016, to transform your savings into wealth.